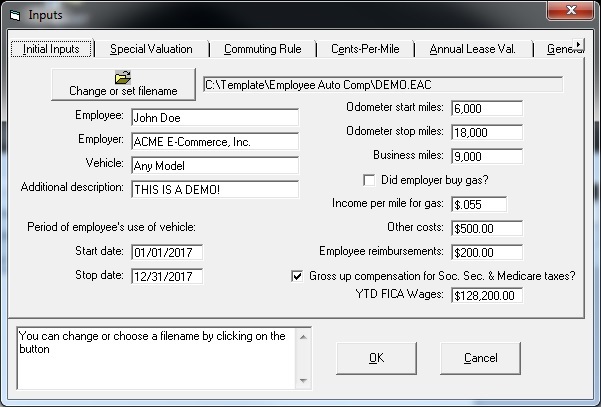 Employee Auto Fringe Benefit Calculator: Quickly and easily determine how much should go on an employee's W-2 for personal use of the company car. This program also computes the lease inclusion amount. This program is used by accounting firms, private and publicly owned business, colleges & local governments. After December 31, you will probably need to make a Social Security and Medicare Tax gross up. The Employee Auto Compensation Calculator Order & Download Now! Special discounted price through 4/27/2019 $89. Regular Price $119. IRS Auditor Question: Show me how you computed the personal use fringe benefit for each vehicle. - This is a frequent business audit question! If the agent is looking at executive compensation, the agent will probably use the IRS's "Executive Compensation - Fringe Benefits Audit Techniques Guide." Page 4 of that guide specifically discusses personal use of a car or vehicle. Reports generated by the Employee Auto Compensation Analyzer were able to successfully defuse this issue. Employees will have to amend old tax returns, and pay tax that they didn't think that they owed. This is not good for employee moral! Employers can be subject the §6721 penalty for failure to file a correct information return for each employee with personal use of a company vehicle. "At year end we have to calculate personal use of the auto's before completing W-2s, and this program is used by everyone in the office. It saves time and is fast. We have been using this program for years. My employees remind me to reorder every year. Thank you for a great product." "Fast and convenient and very accurate." "Quick and easy to get calculations." Note: This computation has several descriptions, including auto fringe, auto fringe benefit, personal use of company vehicle. In the "good old days" the personal use of a business vehicle wasn't an issue. Back then, the employer looked the other way. The employer got a deduction for the car. The employee got a "tax free" fringe for personal use of the company car. Of course, that tax free fringe never was supposed to be tax free at all. Now Form 4562 has a specific section where vehicle issues need to be disclosed. It is pretty clear on that form, if the personal use of the car is not zero, the employer will have to include some amount on the W-2(s) for personal use of the vehicle(s). Failure to do that could result in penalties for the employer, additional tax (when it is least expected) for the employee, possible preparer penalties and possible dividend treatment. The DTS Employee Auto Compensation Analyzer saves your time and reduces your frustration dealing with these calculations. The program will lead you through the qualification tests and make the calculations. The program helps you to quickly arrive at the lowest allowable fringe benefit for personal use of company vehicles. This program also computes the auto inclusion or auto lease inclusion (vehicle inclusion or vehicle lease inclusion) amounts. Since both the employee and the IRS might be curious how this calculation is made, the program generates excellent reports. Report personal use of company owned auto in W-2, Box 1. It may also be optionally reported in W-2, Box 14. Order & Download Now! Special discounted price through 4/27/2019 $89. Regular Price $119. (2,891KB Approx. 3 minutes with broadband download) Order licenses for additional machines. If you want to take a FREE no - risk look at this program, simply download the free demo (4,326kb).